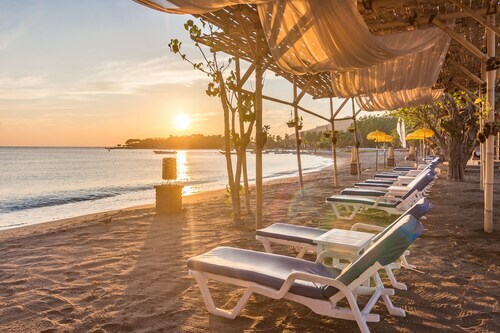 Nestled on the beach, this Pemuteran hotel is within a 15-minute walk of Bio-Rock Pemuteran Bali, Pemuteran Beach, and Reef Seen Turtle Hatchery. Pulaki Temple is 2.3 mi (3.7 km) away. 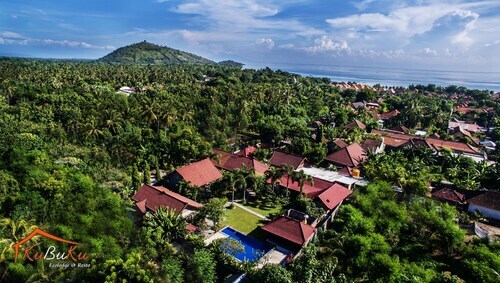 Offering direct access to the beach, this Pemuteran resort is next to a golf course and within 1 mi (2 km) of Reef Seen Turtle Hatchery and Pulaki Temple. Atlas Pearl Farm and West Bali National Park are also within 12 mi (20 km). Nestled on the beach, this Pemuteran resort is within a 10-minute walk of Pemuteran Beach and Reef Seen Turtle Hatchery. Bio-Rock Pemuteran Bali and Pulaki Temple are also within 2 mi (3 km). 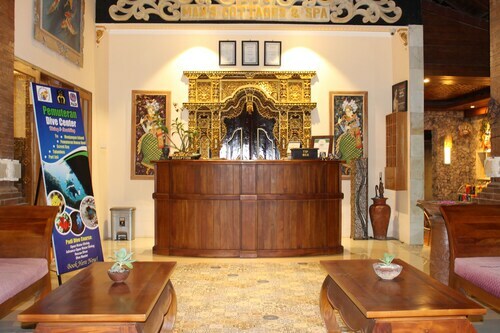 Situated in Pemuteran, this spa resort is within a 15-minute walk of Pemuteran Beach and Reef Seen Turtle Hatchery. Bio-Rock Pemuteran Bali and Pulaki Temple are also within 1 mi (2 km). This family-friendly Pemuteran hotel is located near the beach, within a 15-minute walk of Pemuteran Beach and Reef Seen Turtle Hatchery. Bio-Rock Pemuteran Bali and Pulaki Temple are also within 2 mi (3 km). Situated near the beach, this guesthouse is within a 10-minute walk of Pemuteran Beach and Reef Seen Turtle Hatchery. Bio-Rock Pemuteran Bali and Pulaki Temple are also within 2 mi (3 km). This family-friendly Pemuteran resort is located near the beach, within a 10-minute walk of Pemuteran Beach and Reef Seen Turtle Hatchery. Bio-Rock Pemuteran Bali and Pulaki Temple are also within 2 mi (3 km). This family-friendly Pemuteran hotel is steps from Reef Seen Turtle Hatchery and Pemuteran Beach. Bio-Rock Pemuteran Bali and Pulaki Temple are also within 2 mi (3 km). Spending some time in Pemuteran? You've struck gold. There's a fair number of available hotels close by. 16 of those are within 5 kilometres of the middle of town. Stay close to all the action at the Matahari Beach Resort & Spa and Amertha Bali Villas Beach Front Resort and Spa. Take a big breath of the fresh air at Pemuteran Beach, and let all your stress disappear. 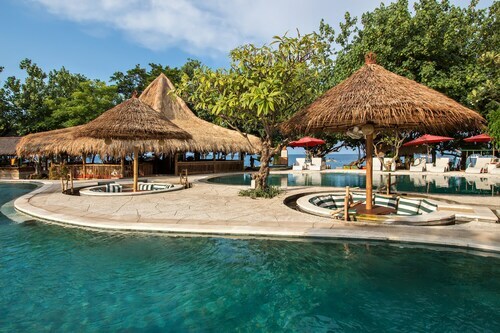 Taman Sari Bali Resort & Spa and Taman Selini Wahana Beach Bungalows are excellent options if you're eager to be in the vicinity of this attraction. Plan a trip to Reef Seen Turtle Hatchery, where they focus on the well-being, happiness and protection of their animals. Stay at Adi Assri Beach Resort & Spa and Jubawa Homestay and you can stop by this hotspot as often as you'd like. This destination contains just a limited number of budget accommodations for travellers on a shoestring. The Mango Tree Inn is one of the best options. 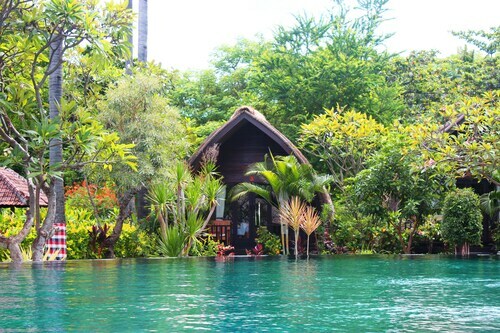 For more options, checkout the Menjangan and the Naya Gawana Resort & Spa. They are 10 kilometres and 8 kilometres respectively from the main center. 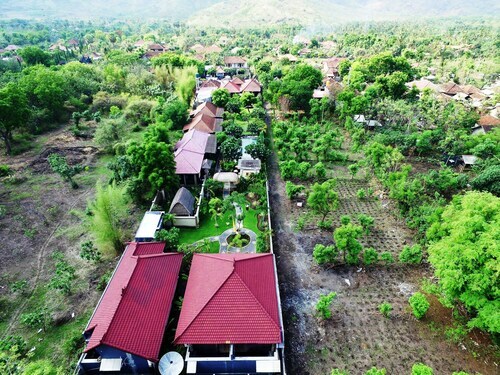 Others are the NusaBay Menjangan by WHM, 14 kilometres away, and the Taman Wana Villas and Spa, 15 kilometres. If you want to check out some close by cities, check out Pekutatan and Gobleg. Journey 35 kilometres to the southeast of Pemuteran and you'll discover Pekutatan. Alternatively, Gobleg is 50 kilometres to the east. Pekutatan hotels include the Kelapa Retreat & Spa and Medewi Bay Retreat. The Munduk Moding Plantation and Puri Lumbung Cottages are some of the ones in Gobleg. Situated 85 kilometres away from Pemuteran is Ngurah Rai International Airport. Stay nearby at the Four Seasons Resort Bali at Jimbaran Bay or the Temple Hill Residence Villa. How Much is a Hotel Room in Pemuteran? Hotels in Pemuteran start at AU$32 per night. Prices and availability subject to change. Additional terms may apply. 5.0 We loved it here. Would recommend this to anyone. We had a beach front villa and could hear the surf from our bed. A particularly lovely way to fall a sleep. Staff were very friendly and helpful. The food was delicious and the massages complete bliss. We stayed for 6 days and had one every day except the last day when we had 2! Ameretha offers lots of different tours which are priced middle range and are well run. For a full day tour lunch is included and it is delicious. We did their tour of a local waterfall and we had a lot of fun climbing the waterfall with our guides. There is a turtle sanctuary next door to the resort and a coral reef literally out the front. I have no words to describe the unforgettable experience we had at the Menjangan. This place is heaven and we will be back for sure. The staff is so nice and the service like nowhere else. The food is absolutely amazing and the decor splendid, peaceful and quiet. Our room at the monsoon was spacious and confortable, and they would leave home made treats and fruits for us before bedtime. The breakfast à la carte was to die for. Again a big thank you to the staff, they are gorgeous people and made our stay unforgettable!!! Very sad we had to leave the menjangan. 4.0 Great hotel. Need to work on the menue. Overall a great hotel, but the food at the restaurant was pretty ordinary. Staff were great though, and would highly recommend Adi Asri.